(by Philip Pullella, Reuters) VATICAN CITY – The Vatican’s Swiss Guard, the colorfully dressed mini-army that helps protect the pope, will have cooler heads now they have swapped their ancient metal helmets for ones made by 3-D printers. The new helmets, made of a thermoplastic, were distributed to the corps on January 22nd, the 513th anniversary of their foundation as a mercenary force in 1506, the Vatican said. They are nearly identical in appearance to the previous version but bear the coat of arms of Pope Julius II, who first used the corps for his personal protection. One of the main advantages of the new helmets is that they will not heat up like the metal ones, meaning the guards will sweat less, said spokesman Urs Breitenmoser. News site Swissinfo.ch said the old helmets, made in Austria, weighed two kilograms (4.4 pounds), while the new ones, made in Switzerland, weigh 570 grams (1.2 pounds). 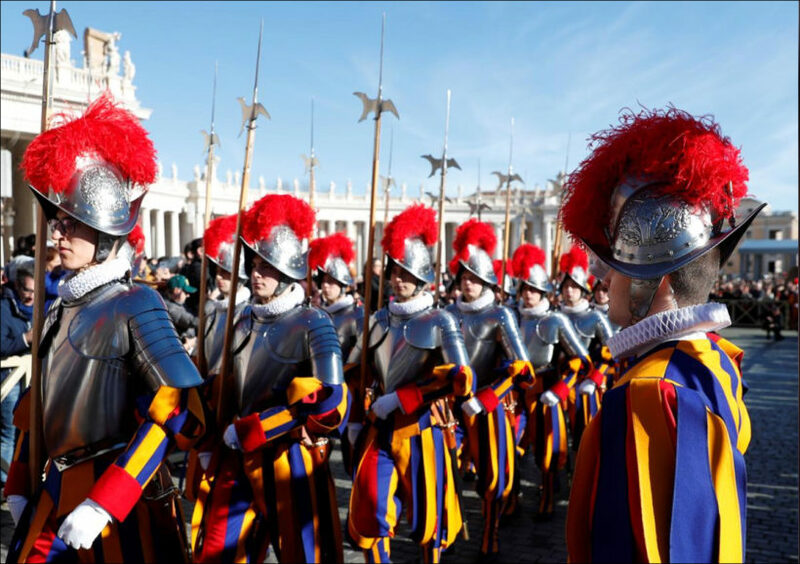 The Swiss Guard wear the ceremonial uniforms of yellow, red and blue stripes at official papal services such as Masses and visits by heads of state. The force, which numbers about 110 men, normally dress in plain clothes and more simple blue caped uniforms with berets.